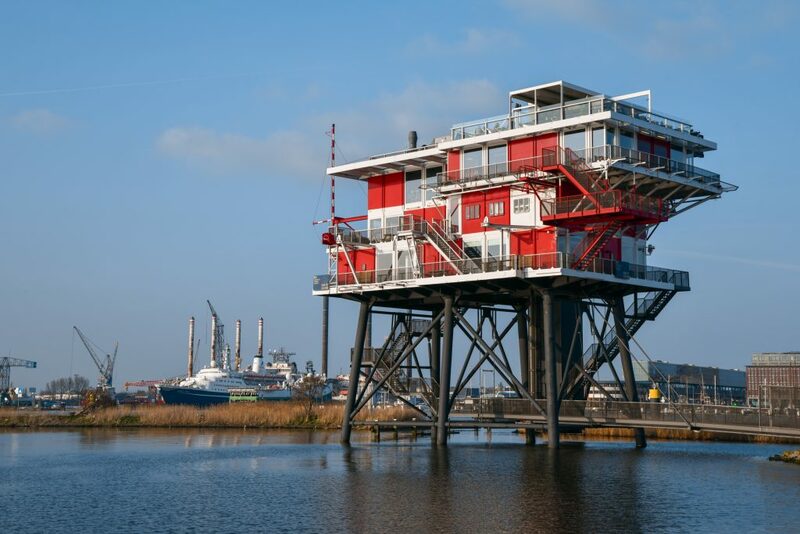 Last Saturday was open tower day in Amsterdam. The perfect opportunity to get my tourist mode on and find my city’s best views. Do you love rooftops as much as I do? Of course you do! 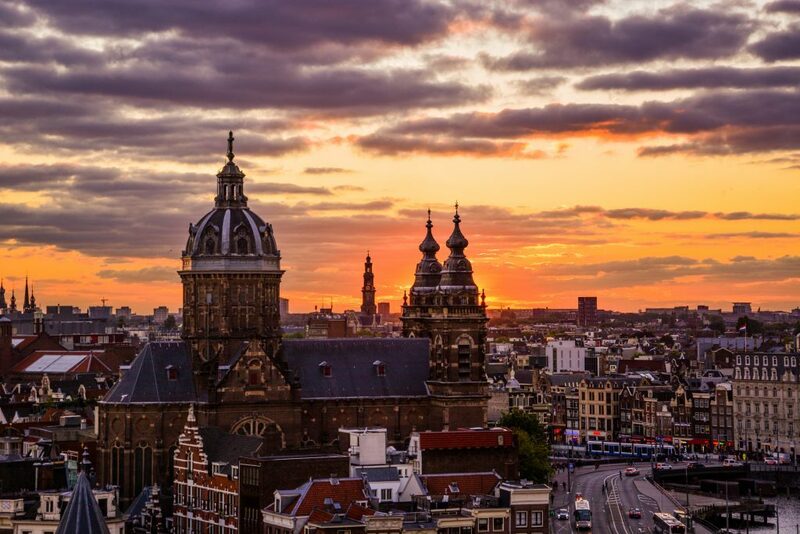 Get ready to add a lot of places to your Amsterdam to do list. The W hotel has a very fancy bar/restaurant area with a view of the Royal Palace and Magna Plaza. There’s even a swimming pool, although there aren’t many days warm enough in the Netherlands to actually go for a dip. The ‘Oude kerk’ tower It is the oldest church tower in Amsterdam. It’s only open to visit from April to October. The first version of the tower already was built in 1300. Through the centuries changes have been made and parts have been added to the tower. It gives you a great 360 view of the city and all he cute canal houses. This is the highest church tower in Amsterdam. 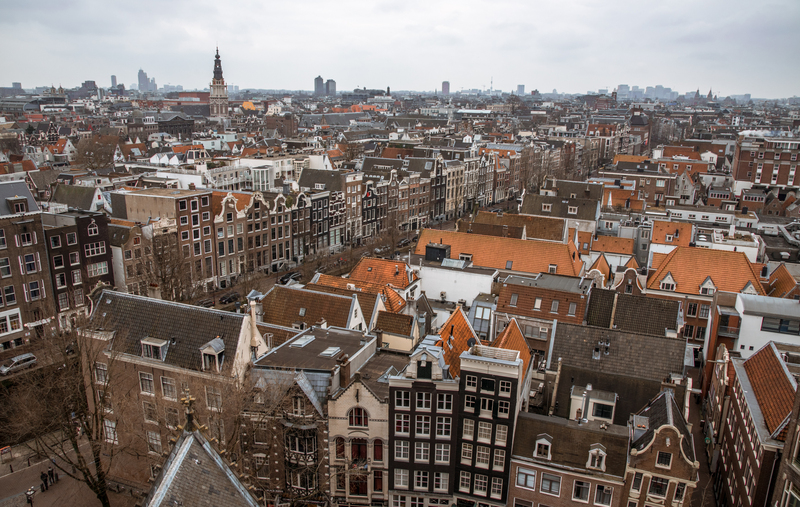 It will give you a great view of popular neighborhood the ‘Jordaan’. You can only climb it with a guide, but I think it’s worth it having someone share the towers history. Head up here for the best sunset view in the city and slightly overpriced drinks;) The sun sets right behind the St. Nicholas church. The Hilton is right next to Central Station so it’s an easy place to get to. I’d seen this building from afar many times and it’s weird architecture peeked my interest. Turns out it used to be a broadcast platform for a TV channel, but nowadays it’s a restaurant. It’s a fun place to visit if you’re eager to explore more than just the city centre. 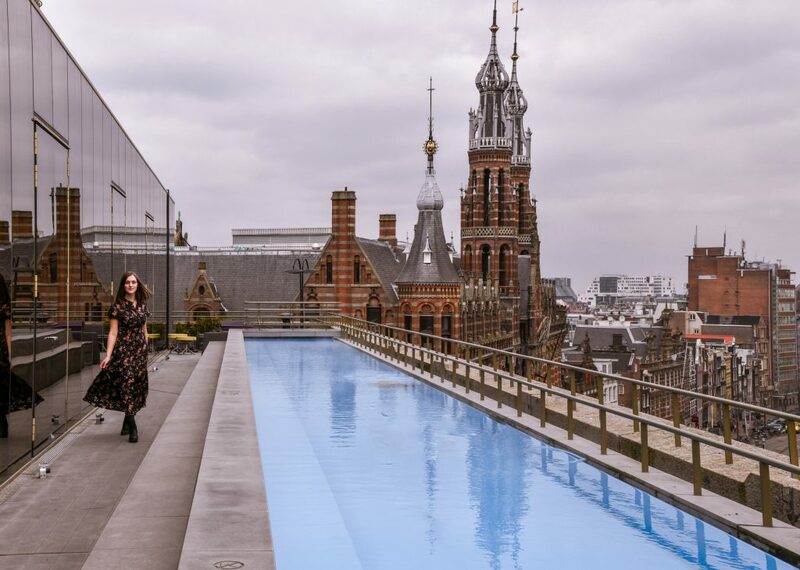 With good weather you can also enjoy a drink on the rooftop terrace. Conveniently located next to central station, you might as well give this tower a quick visit. 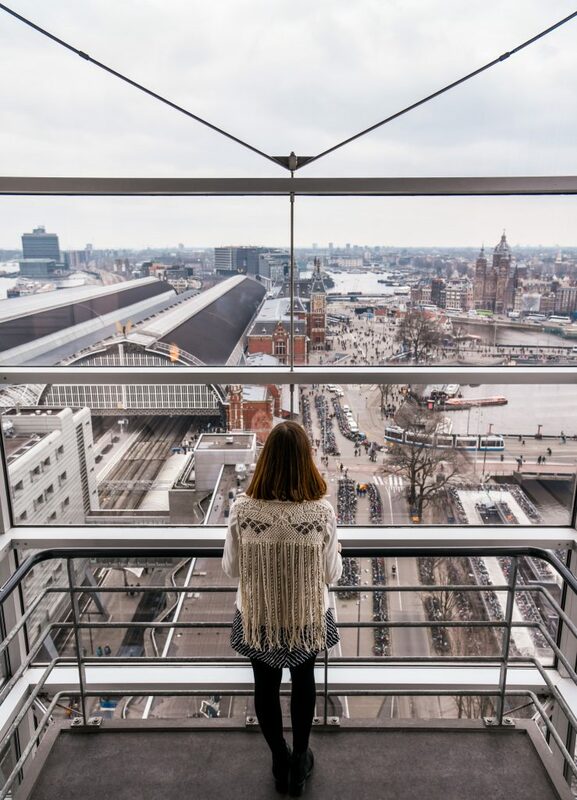 The eleventh floor has a 360 view of the city. If you happen to be shopping in Amsterdam’s biggest shopping street the ‘kalverstraat’, stop here for coffee or lunch. 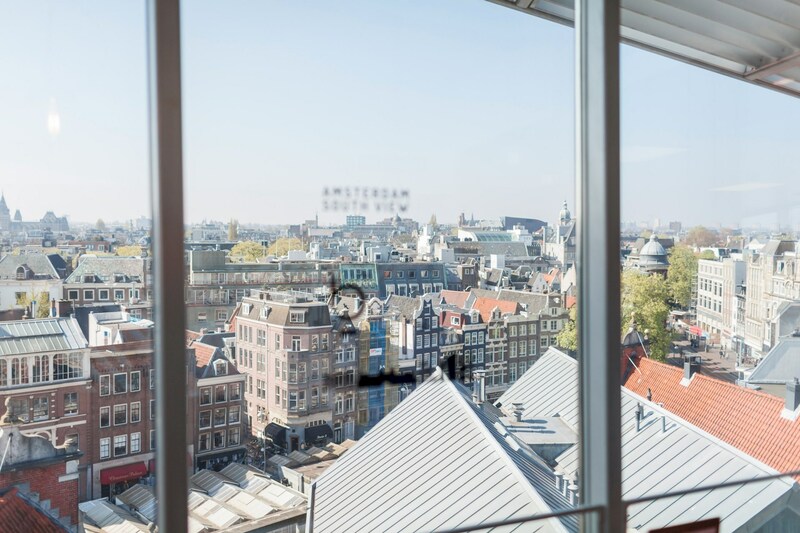 Blue Amsterdam is a bar and restaurant with a 360 view of the city. You get there by heading to shopping center the ‘kalverpassage’ and taking the glass elevator up. 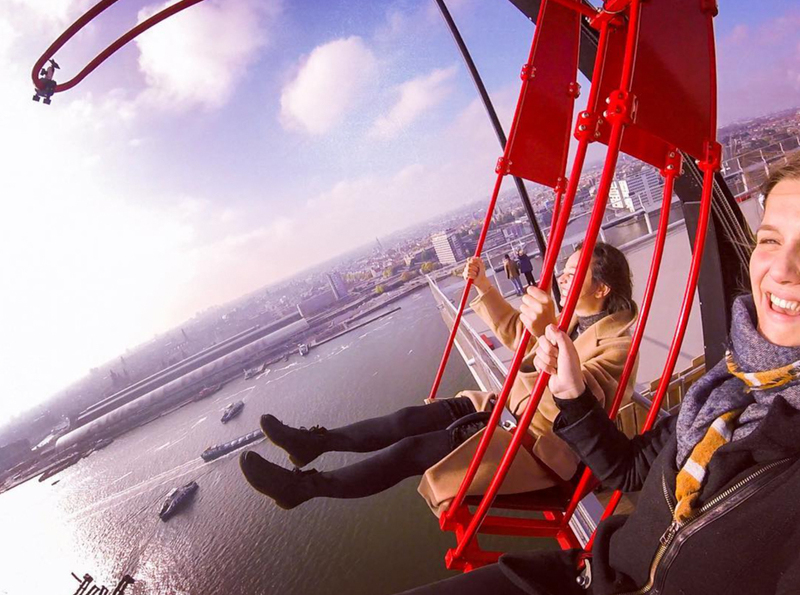 This one is only for the bravest among you;) The A’dam lookout tower is home to Europe’s highest swing. It’s called over the edge as you swing over the edge of the building! To get to this tower you can take the free ferry at the back of Amsterdam Central Station. 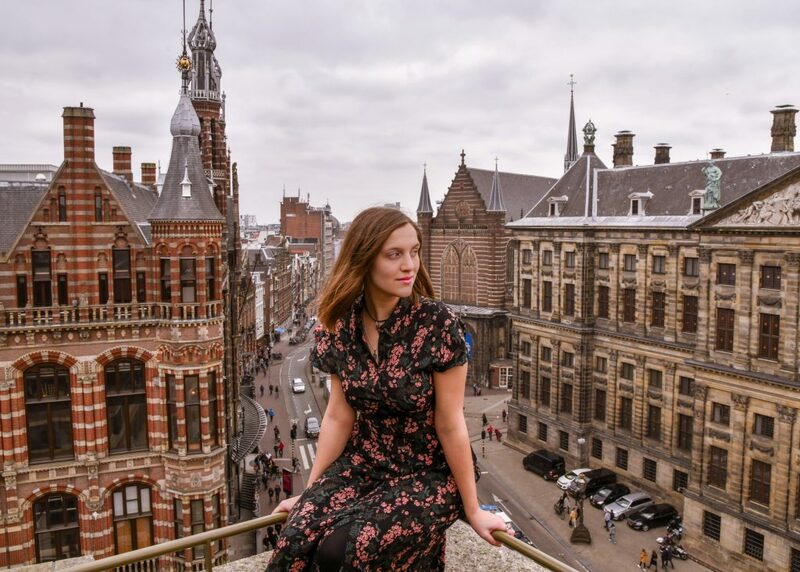 For more things to do in Amsterdam you can read my extensive list of cool things to do in Amsterdam.